Every community has strong teachers who help their students learn to high levels. But far too often low-income students and students of color are short-changed when it comes to teacher quality. Federal law requires states to end these disparities. But states, recognizing that most hiring, compensation, and promotional decisions, not to mention choices about school working conditions, are made at the district or school-level, have asked what they can do. We have reviewed a number of state teacher equity plan drafts, and some state offices have reached out to The Education Trust for assistance and feedback on their plans. 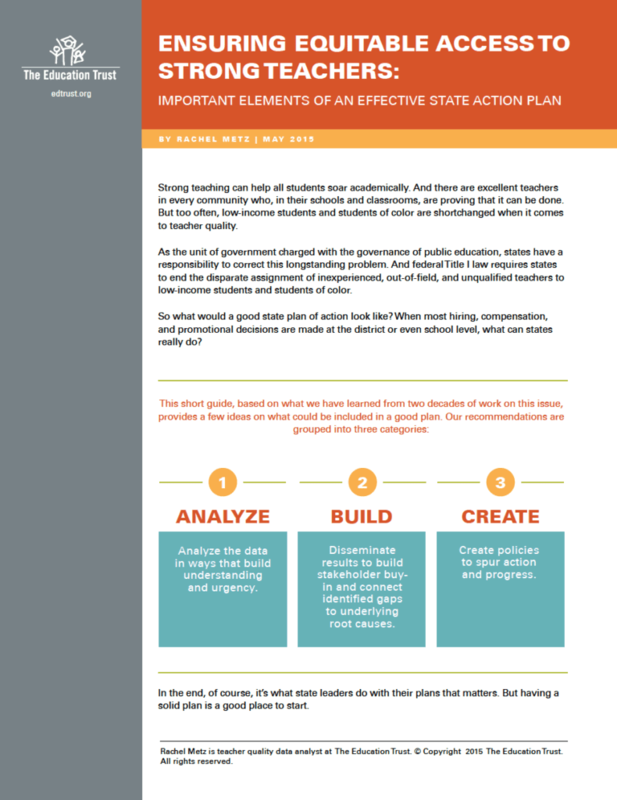 As state education leaders prepare their state teacher equity plans, “Ensuring Equitable Access to Strong Teachers,” provides a framework to fine-tune and strengthen their final drafts. We hope this resource assists states in their ongoing efforts to ensure every low-income student has the benefit of a highly effective teacher.